with Paolo's creative and experienced advice. Give your art and pictures a new look with a new frame, or replace the old matt borders! is completely amazing for protection and glare reduction! and production computer-cut matt picture borders. Volume orders welcomed! to any size to order. best quality stretcher bars in various thickness. Free Picture framing quotes with on-screen visualization and a PDF copy emailed to you will include the image showing the frame and mats in place, it will take the guesswork out of how the finished frame will look! You can even tell us your wall colour where your art or photographs are going to hang and it will be on the quote behind the framed image! Colin has worked as professional illustrator for Rolls-Royce, before migrating to Australia in 1987Here he worked on the Black Hawk military helicopter as chief Illustrator. Colin was responsible for the production of artwork associated with promoting the company world wide. HDH was subsequently taken over by Boeing on the new Airbus A380, Boeing Dreamliner and the Joint Striker Fighter (JSF), Australia’s new front line fighter aircraft. Colin left Boeing in 2005 and perues his passions. Colin's favoured medium is acrylic, but he also paints in oils and water colours. Colin is a busy commission artist. 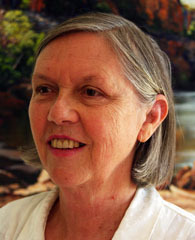 awards and commendations at various exhibitions and her work can be found in the homes and galleries of well known collectors. Since settling in Australia she has exhibited successfully in Sydney, Melbourne, Adelaide and extensively throughout Queensland. Her showings were excitingly different and many of her exhibitions were sell-outs. 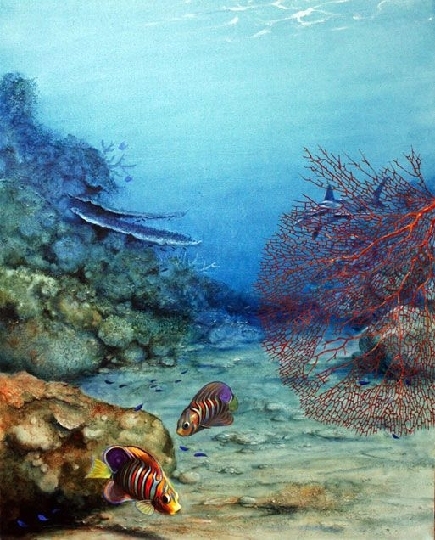 underwater work reflects the true life and habitat of all fish species and plants. Japan and the USA and have sold well in other countries around the world. Reef’s underwater world as "A Liquid Eden”. is now retired from the gallery and plans a more pieces in the future. Giovanna will be 80 years old next year and still painting. In 2003, Greg received the Geoff Douglas Memorial Encouragement Award for first year exhibitors from the Wildlife Art Society of Australia. He has recently been chosen as the winner of the Australian Artist ”Favourite Subject Challenge, No 59” for his Blue Wren painting titled "Faeries”. Laila was born north of Copenhagen, Denmark. From an early age she knew the path in her life would be too express herself in some form of art. This desire brought her to study full time for 5 years at Copenhagen Art School, examining many different mediums and learning the classical way of drawing and studying the figure. 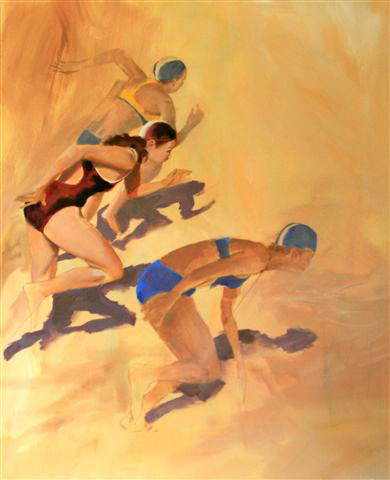 A few years at various art colleges in the USA completed her formal schooling in the arts. As she has continued expanding her expression through various mediums, she acknowledged that being an artist is an ever evolving wondrous journey that never ends. In 1985, a new phase started with immigrating to Australia. Lailas life expanded to include 3 beautiful daughters and a busy time with numerous exhibitions mainly showing paintings and drawings. Sculpting had always been a fascination for Laila, but no access to a foundry had made it difficult. In the year 2000, Laila began to sculpt. Sculpting and drawing are very closely linked and it was a joy to combine years of honing her drawing skills to expand into the new media, clay. The intimacy and the sensuality is a continuous link throughout all of Lailas creations. They speak to your heart. Simple as that. Natalie Dyer is a highly inspired artist. 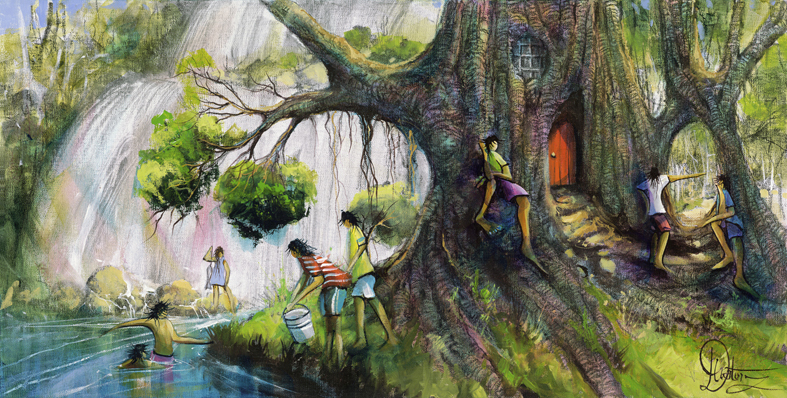 She paints with a genuine gift and has a unique ability to involve her audience as she depicts our everyday lives in a fresh and vibrant way. Natalie enjoys pushing the boundaries between the traditional and the contemporary - feeling equally comfortable in both. Her versatility means that people from all walks of life can identify with, and are uplifted by her paintings - keeping her constantly busy in her favourite place, her studio. Natalie's "Women with Attitude” series - is a whimsical look at what women today just love to do - they are as popular as her enchanting, softly-flowing girls walking in a haze of lavender fields or along quiet beaches. Vibrant flowers and rich, colourful abstracts also tantalise art lovers, whilst her landscapes, streetscapes and seascapes will often showcase the beauty of her surrounding. metallic gloss on acrylic, or canvas giclee. Raelean Hall was born in Victoria in 1969, but has resided on the Sunshine Coast since 1976.
are especially well depicted in her Sumi-e works. scenes of people on the beach in black on white to great effect. 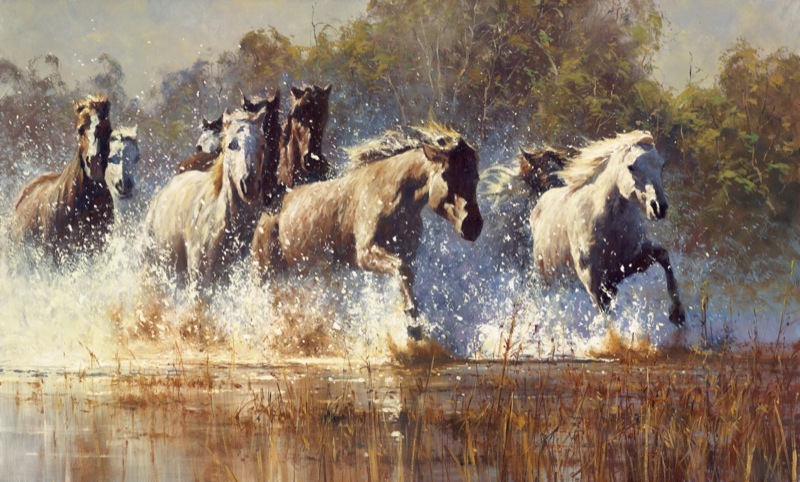 private collections across Australia and in the U.K. and in the U.S.A.
Robert Hagan original art shows his mastery of light and shadow ..
and educated at Newcastle University, he communicates in a typical offhanded Aussie manner. Robert goes about his art with confidence, humility and pragmatism. one occasion. It's all there, but its not defined and it's that which is peripheral to the starting point". The key to impressionism is keying in the peripheral to the starting point". the head! That's impressionism, and that I hope is where I am"
Click Here to see some of Hagan's Splash Of Colour TV Series. Landsborough Galleries, Sunshine Coast Hinterland. Ted Moran is a professional sculptor who began his career with Metal and Glass on the Mornington Peninsula, Victoria. 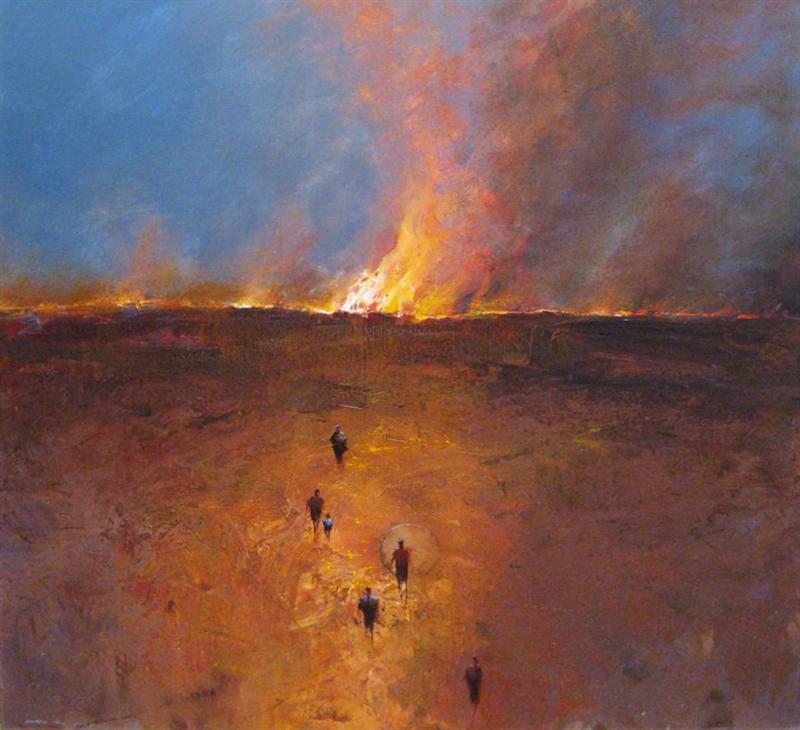 He is now based at the Sunshine Coast, exhibiting in several galleries. After completing his training as a fitter and turner at the age of twenty-two, he was encouraged by a work colleague to explore creative work in the metal mediums. His career in this art form includes sculptures in stained glass panels and combinations of metal Stone and and glass blocks. * Peninsula Grammar Chapel: Stained Glass, Sculptured steel and glass screens. * St Vincents Private Hospital: Stained Glass, Sculptured steel and glass screens for the Chapel music area. 110 year - old church windows. * Knights of Malta: Crucifixes in the style of the iconic symbols of the group. * Frankston (Monash)Teachers College: Figure flying to the Sun on the building face. * Australian Administration Staff College, Mt. Eliza: Foyer Sculpture in the theme of their insignia. * Scotch College, Melbourne: Sculpture insignia theme of "The Burning Bush" from biblical text. William T. Cooper first gained artistic prominence for his ornithological illustrations in A Portfolio of Australian Birds. His international reputation was firmly established in 1973 with the publication of Parrots of the World and today Bill's paintings are housed in public galleries, government institutions and private collections throughout the world. William passed away May 10th 2015 painting till his last day. Bill's talent for combining scientific accuracy with vibrant artistic technique was formally recognized in 1990 when the Academy of Natural Sciences of Philadelphia (USA) awarded him the gold medal for his 'artistic endeavours and life's work which have contributed to mankind's better understanding and appreciation of living things'. He was the first Australian to receive this prestigious award and in 1994 was awarded the Order of Australia (AO) for his contribution to Art and Ornithology. The 1,236 fruits illustrations reproduced in this book show William T. Cooper's dedication to the world of nature. He captures the finest details - from tiny spines on pods to fibers of palm fruits and imperfections created by living creatures of the rainforest. Each painting shows the ranges in size, shape and colour of the fruit as well as a cross-section exposing the distinctive colour and texture variations of the seed. It has been a rare privilege to publish art of such magnitude, skill and beauty.